A million years ago (give or take a bit) I spent a few months in Italy as part of a geology course I was taking. We stayed in a tiny village in the Marche region, with occasional field trips elsewhere. We did most of our own cooking, under the supervision of our professors (one Italian and one American), and our diet was pretty repetitive: fresh rolls from the bakery down the road for breakfast, spread with chestnut jam; also cornflakes stirred into blueberry yogurt. Sandwiches for lunch, made from very hard rolls and very ripe pecorino (we referred to it as the Stinky Feet Cheese). Dinner was always, always pasta, but fortunately there was some variation in the toppings, many of which were really delicious. Some of my classmates put together a small recipe book, and I continued to make many of my pasta sauces from this collection for many years afterwards. One of these sauces that was in my regular rotation was made up of sauteed eggplant mixed with sun dried tomatoes, chopped nuts and mascarpone cheese. It had a great nutty, savory taste and was a nice change from the endless red sauce/pesto rotation. As J and I started to phase out high glycemic foods from our diet I stopped making pasta for dinner as a regular thing, and the eggplant sauce disappeared from the repertoire. Last week, though, as we were staring vacantly at grocery store produce with very little inspiration, we saw some eggplants that looked halfway decent, and J said, “What about that eggplant walnut sauce you used to make? 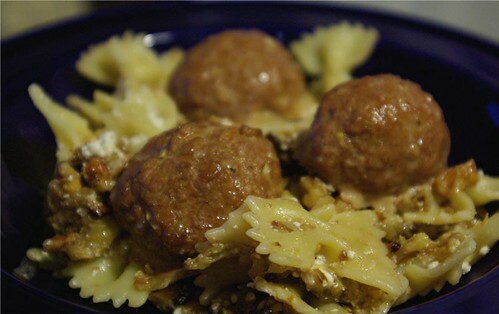 What if we did it with meatballs?” And so we did. First, while the oven was preheating for the meatballs, I dumped all of our remaining stock of walnuts onto a baking sheet and toasted them a bit. I almost forgot them, like I always do, but fortunately I smelled them in time. 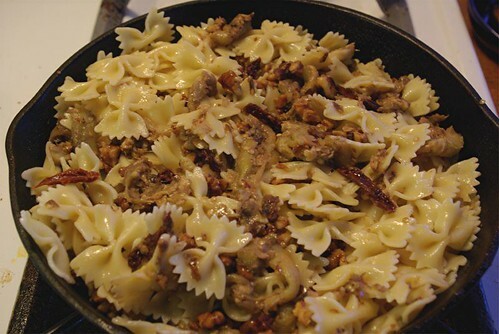 I cooked up half a pound of bowtie pasta (farfalle), drained it and set it aside. I cut the eggplant into strips and sauteed them with some chopped garlic in plenty of olive oil, until they were soft and nicely golden on the edges. I tossed in a handful of julienned sun dried tomato that we had in the freezer, followed by the walnuts. We didn’t have any mascarpone, but there was a little ricotta left from the asparagus tart, so I scraped that in. When this (rather unattractive) mixture was hot through, I stirred in the pasta and mixed it all up well. J made his usual meatballs with plenty of garlic and baked them in the oven, then we piled it all up on plates and dug in. Our original thought had been to put the sauce directly on the meatballs and not have pasta, but I think it’s better with the noodles. Some things are worth the carbs! This has been added to the TODO list! Please specify how to cook the eggplant?